First off if you've only come here for the instagramable hot spots in PS, scroll down. 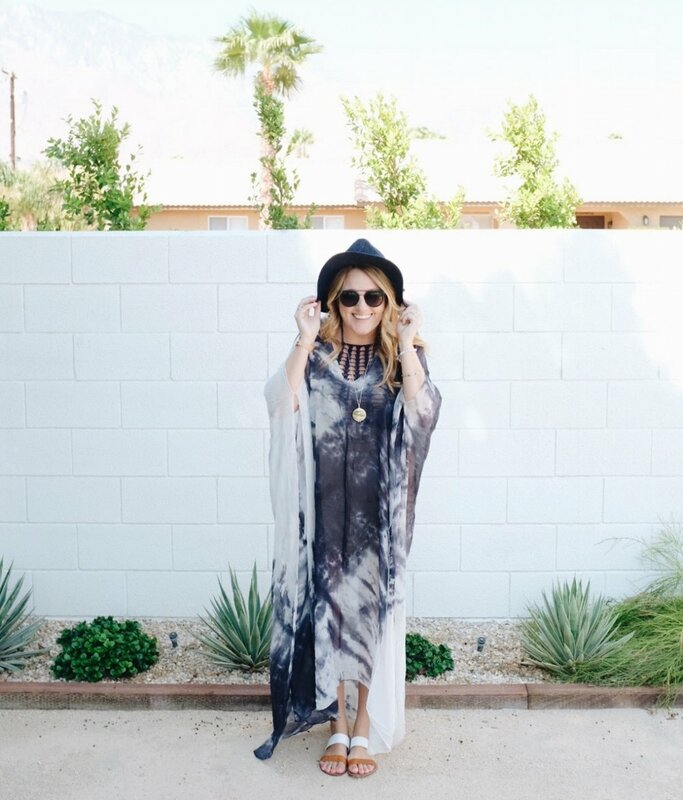 I've included my top 5 Instagram worthy places in Palm Springs (with locations) for you at the end of this post. 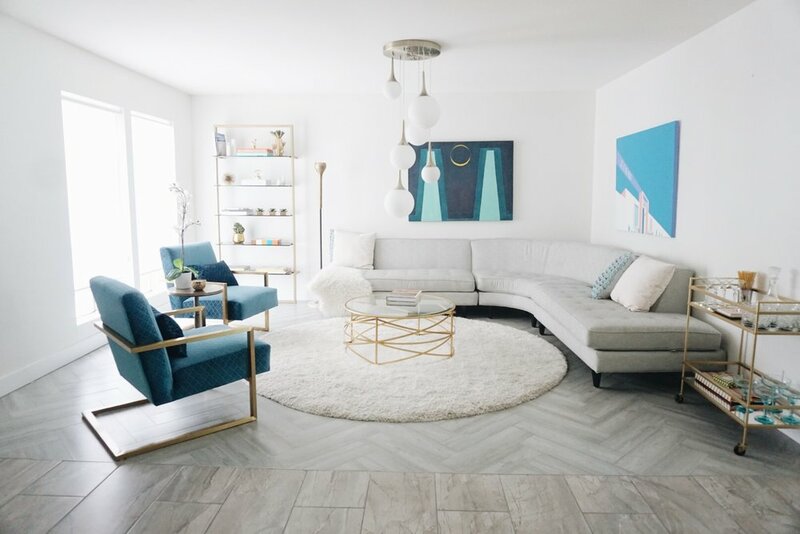 Totally oversharing my girls trip to Palm Springs with 9 bloggers in the most epic Air BNB. 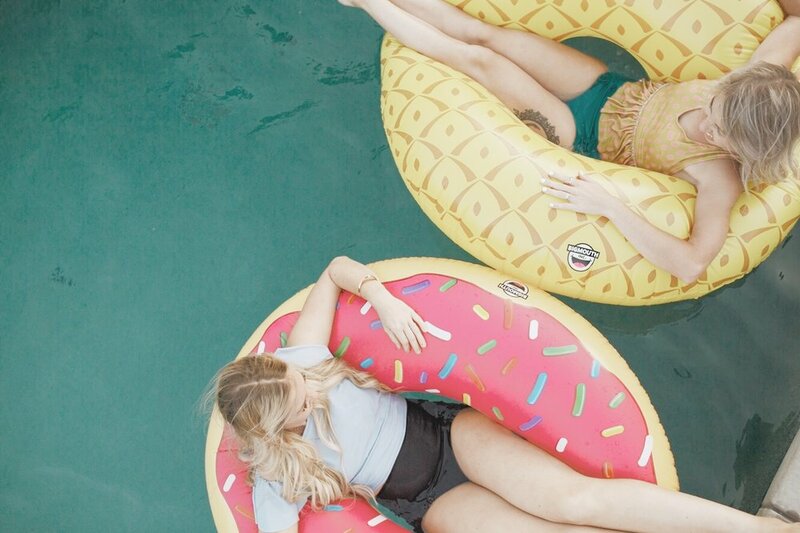 This will give you all the vacation envy and maybe even inspire you to book your own girls trip! I talk about all the hot spots, places to eat, and I even share my top 5 most instagram worthy places in PS. Growing up in Manhattan Beach meant warm nights, long summers and living in my bathing suit. I'm a salty hair, sandy toes and sunburned skin type of girl! I've been to Palm Springs too many times to count. Because PS was only a two-hour drive from home it became my go-to staycation spot. My typical agenda when I visit is to stay at my hotel and lay by the pool as much as possible. I normally stay at the Parker, and if you've ever been, you know there is no reason to ever leave the hotel, it insane. But this time, of all the times I've ever been was one of my most memorable times ever. I went to test out my Big Brother skills and planned a vacation with 8 other women I'd never met. I'm already starting my audition reel for the 2018 season. Jk. We all decide to make time for US, and we somehow found a way to book a 4-day trip without our kids. Say what? How did we do that? Well, you basically book a flight, ask your husband to watch the kids and you just go. It's that easy. We stayed in the cutest Air BNB with 8 influencers and the most adorable little 6 month old ever. I'd never met these women IRL but the moment I walked in the door, I felt like I was vacationing with my besties. I've been in a comment pod on Instagram with these women for over year (for those who don't know what a comment pod is, don't worry... it's basically a group text with people you don't know). So, I guess I kinda knew them going into it, as much as you can know someone through a daily group text, I guess. This blogging world can sometimes be isolating because you're sharing your innermost self with people behind a screen. Meeting these beautiful women IRL was necessary after we've exchanged 100's of texts with each other. So what did I do with 8 of my closest social media friends on a Wednesday in Palm Springs? Here it goes. 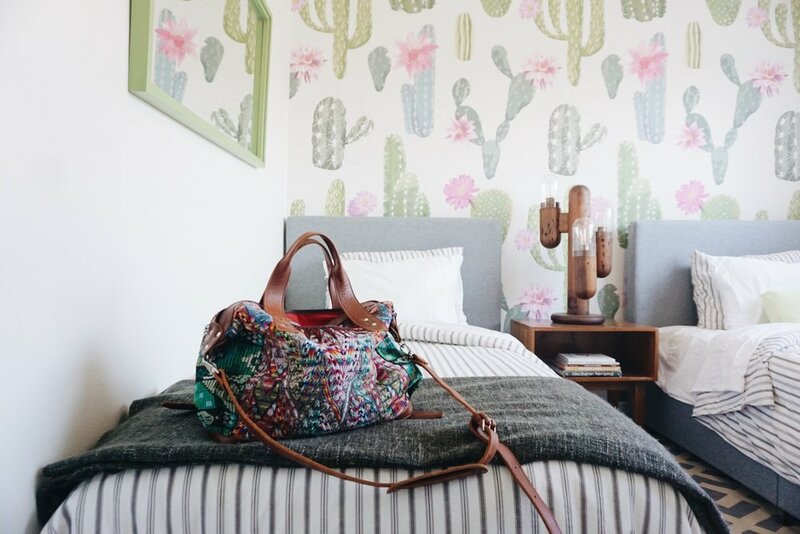 We stayed at @thewkndhouse in the heart of Palm Springs and this just may replace my typical hotel stay from now on. It was so, so good for so many reasons. Number 1- it's super close to downtown. Number 2- the rooms were perfection. And Number 3- just the right size with the most perfect Instagramable walls. We are all bloggers so, duh. We ate tacos (pretty much every day we were there) , we drank rosé (you guessed it, every single day), and we took lots and lots of pictures. We went on this trip with no plans, other than couch hangs & pool time with no kids, visiting a few instgrammable hot spots and late night chats about balancing motherhood and blogging. And honestly, that's pretty much all we did. I got the best room. Shhhh! Don't tell the anyone else. If you decide to go, just plan get there early and snag the flamingo room for yourself! That wall, and It's closest to the potty (bathroom for you non-parents reading this, lol) and the kitchen for those late night snack runs! 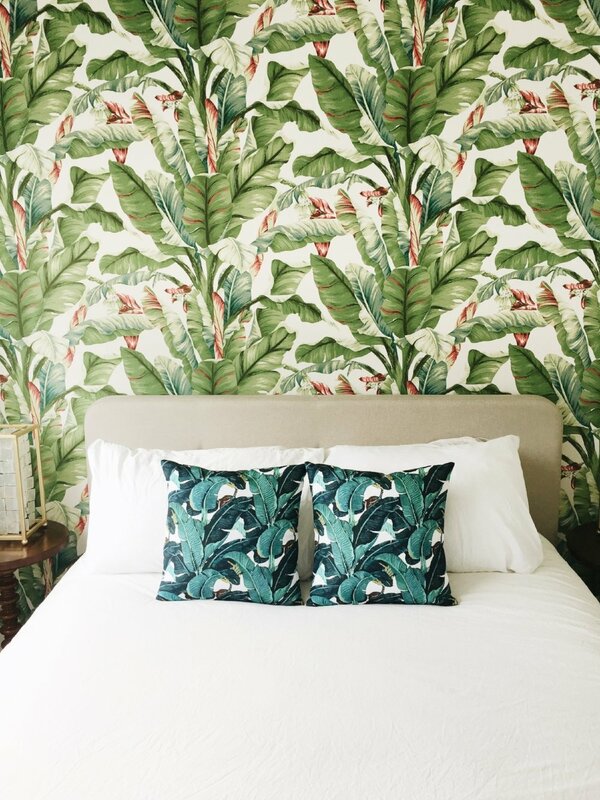 The master suite has pretty much the most perfect wallpaper ever. And of course the other rooms make you wanna go wallpaper your entire house too. We all held hands, and we all agreed to jump on the count of three. I think it's safe to say, the joke was on me. I guess that's payback for all the times I did this to other people. #karmasabitch. Yes, that splash is mine. And yes, those two girls don't know how to count to three. Oh I will be getting you two back @_ashley_noel_ and @helloerinv. I know where you live. Of course we needed to really spend some QT together at the house so we did a grocery store run and decided to only eat out a couple times. We got fruits, bread, eggs and stuff for Taco Tuesday, ya know... the important stuff. We spent a lot of time at the house because it was so great and we loved getting to know each other. We spent 3 nights curled up and snuggled together on the couch catching up on Bachelor in Paradise and one night we had a game night which included a real hysterical game of heads up and an even more hysterical game of the PG version of cards against humanity. This is when I had to face the reality of being the oldest girl there when I referenced Coming to America [bark like a dog, a big dog] and nobody knew what I was talking about. (insert laughing & rolling eye emoji here). Meet Ollie, hands down the easiest and cutest baby ever. Because of my crazy baby fever, having Ollie with us was really helpful for those 'I'm missing my kids' moments. I know we all really tried to take our mom hats off and make time fully for ourselves but I think we all enjoyed having this little nugget with us while we were away. From our own babies. If you want more Ollie, go visit @annehilldesign. She's the best and she lives in Alaska so you'll probably get a few moose of grizzly bear pics too! We had to visit the two coolest hotels in Palm Springs so we had brunch at the Parker, and spend more time taking photos than we did enjoying our $17 mimosas. The Parker is where I had my bachelorette party, where I've spent numerous "first dates" with my husband and if I ever ran away from life, that's where you can find me. This girl right here traveled all the way from Canada to be with us, at 31 weeks prego, on a red eye..If that doesn't make you love her, I don't know what will! Meet my favorite Canadian @britthavens. We had dinner at The Saguaro and to be honest we went on a Wednesday and when we pulled into the parking lot we thought it might be closed. Needless to say, mid week in Palm Springs is less than lively. But, on a positive note, it was happy hour all day!! So we got thee best tacos ever for $2 a piece! There was 9 of us and the bill wasn't even $100! So that was a huge score! We were bad bloggers and didn't get any pictures at this dinner, but we made up for it the next day when we visited the cactus garden and of course that famous pink door. #thatpinkdoor. 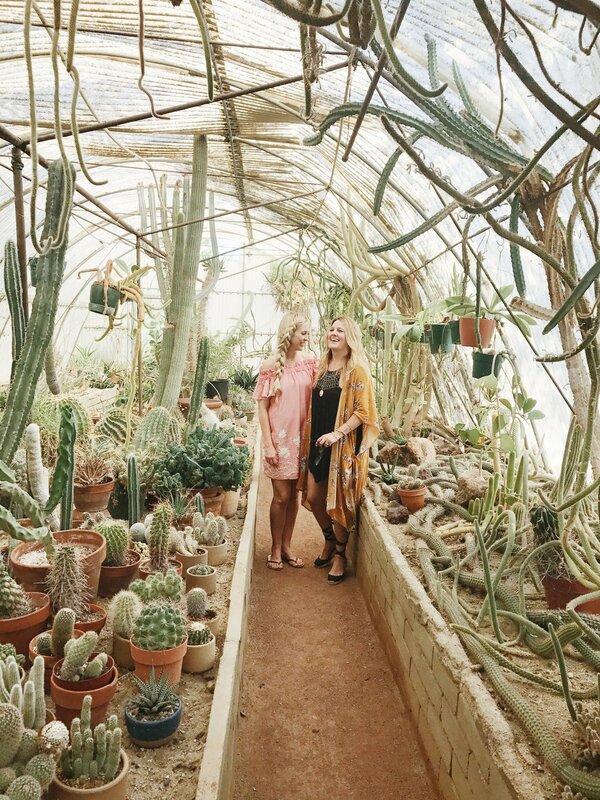 The Moorten Botanical Gardens are a perfect girls trip adventure. It's $5 to enter and this place is insane you guys. It took about 5 minutes to walk through the whole thing, and about 20 minutes to get some plant-lovers dream photos. The picture above is inside the cactarium, and it was beyond gorgeous and hot! It was about 108 degrees outside that day and it felt like 120 degrees inside the green house. But, it was soooo worth it for a photo like this one. In short, or long... life happens only once and you need to make the most of it. Motherhood can be challenging, isolating and one of the biggest life reflecting times on who you are as person. But, finding time to be that person that you were before babies, really is important. I'm not sure these mamas know just how much those 4 days in Palm Springs refreshed me and those memories will stay with me, thank you for the laughs and fun times ladies! Let's do it again next year! There are some affiliate links in this post, but all opinions expressed are my own.